Authorities in Bartlett, Illinois were recently handed what was described as a puppy found wandering alone on the side of a road. Someone brought the pup into the police station, where authorities noticed he was severely dehydrated. "He said he was driving by and saw the dog on the side of the road all alone," said Sergeant Kyle Rybaski to The Dodo. "He picked it up and brought it in so we would take it to an animal shelter." However, before long, the police department began to realize the little animal had some decidedly non-puppy-like features --- including larger than normal paws, very long nails, and a rather coarse coat. Explained Rybaski, "We soon realized that it wasn’t the average puppy. When I picked her up, her fur had a different feel to it. It was wiry." 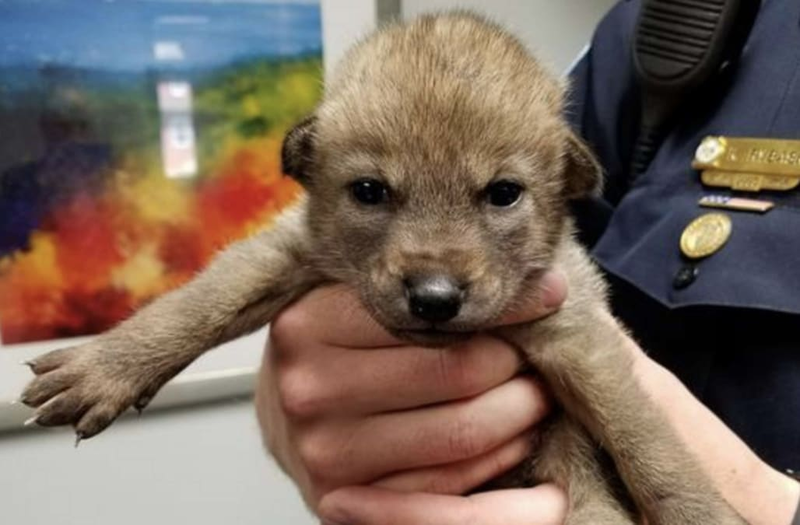 After doing some research, the officers learned that the baby was not a puppy at all: She was a young coyote. Nonetheless, she had likely been separated from her mother and was too young to be out in the world on her own, so she was taken to a local wildlife center.